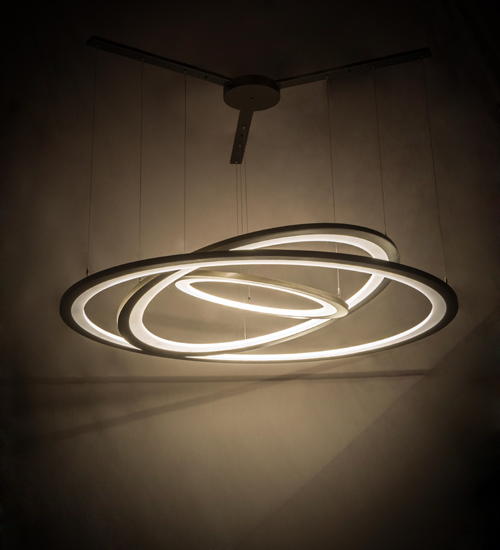 Description: A modern sophisticated system featuring extraordinary adjustable elements of ambient light, 3 elliptic spectral halos appear to rotate in space and create a stunning visual effect and breathtaking drama. Supported by sturdy spacecraft cables for balance and precision, this custom configurable grouping of Bronze finished solid steel rings reveal Contrail Mist Idalight diffusers. Meyda's integral LEDs deliver dimmable, robust illumination, energy savings, minimal maintenance and long life. When 179175 is purchased with 179176 and 179169 as a set of 3, it becomes 185013 and is a value package. Custom sizes, styles and finishes are available as well as other lamping options. UL and cUL listed for damp and dry locations.